Botanists call it the Lagerstroemia crape myrtle, some call it the crape myrtle and southerners call it the crepe myrtle because the plant's flowers are delicate like crepe paper. Whatever you call it, the myrtle tree grows best in U.S. Department of Agriculture hardiness zones 6 through 9, although some gardeners get away with growing the plant in USDA zone 5. Grown as a deciduous tree or shrub, crape myrtles are prized for their bright, beautiful flowers that bloom all summer long and sometimes into the fall. 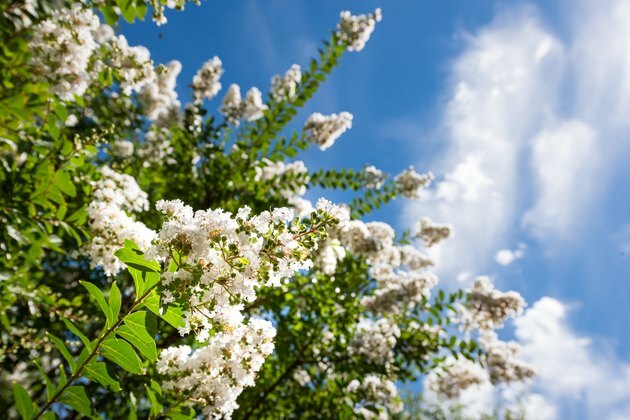 Easy to grow, the crape myrtle's strictest requirement is full sun. Sometimes new construction or a neighbor's shade tree makes it necessary to move an already established crape myrtle to a new location. Most trees tolerate moving well, but it's important to move your tree at the right time of the year and to do so properly. Although it can keep blooming even after the first frost, your crape myrtle will eventually lose both its flowers and leaves, entering a period of winter dormancy, This dormancy is the time to move your myrtle. Wait until late enough in the winter season that the soil is workable rather than frozen, but don't wait too long. You want to move the tree before it starts to create new leaves in the spring. Before disturbing your crape myrtle, prepare its new home. Choose a sunny location with well-drained soil for your tree. Dig a hole that's about twice the size of the root ball you plan to move. To successfully move the tree, you'll need to move it with a root ball of at least two to three feet in diameter. A big crape myrtle may need an even bigger root ball. After digging the hole, toss a handful of slow-release organic fertilizer into it to give the tree a boost. Don't overdo it, however, as overly fertilized crape myrtles tend to produce more leaves and fewer flowers. Too much fertilizer also encourages sucker growth. Begin watering the soil around your crape myrtle daily about three or four days before the move to make transplanting it easier. On moving day, dig around and under the tree to create a two- to three-foot-wide root ball. As you dig, work around the tree's larger roots to preserve them. Working around and preserving the tree's roots will take a lot of digging, so now is a good time to call in any favors your friends and family may owe you. When you've exposed the root ball, gently rock the tree back and forth to loosen it from the soil. You may need to cut extra long roots to free the tree. After freeing the tree, prune back half of it. Once pruned, use a wheel barrel or pickup truck to move the crape myrtle to its new home. This will make large, heavy and unwieldy trees easier to carry. If the new planting location is close, you can also put the tree on a tarp and slide it across the yard. Bring your freshly unearthed crape myrtle to its new home and place it in the planting hole. Gently spread the roots out with your hands to encourage the tree to stretch out into the soil. Position the tree so that the top of the root ball is even with the surface of the soil and backfill the hole. Thoroughly water your crape myrtle after transplanting it. Leave the tree alone after this until it starts to form new spring flowers. When it does, water it once a week during the summer and fall to give it a good start in its new home. When watering crape myrtle, water the roots but avoid wetting the foliage. Wet leaves often lead to disease in this species. After the initial growing season, crape myrtles need little to no care. Simply water the tree if it droops during times of drought and remove spent blooms, if desired, to encourage more flowering.